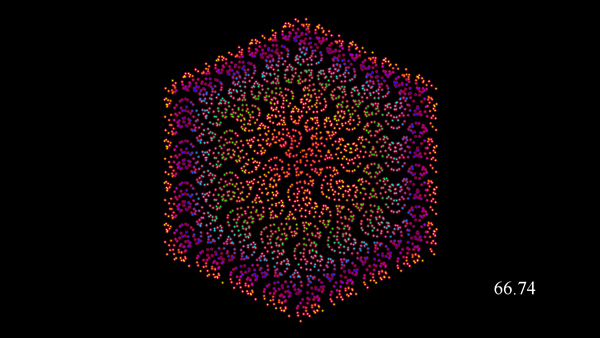 This video describes and gives a small taste of the visual potential of the integer number line that arises from spiraling it around itself on square and hexagonal tessellations. Each cell of such a tessellation becomes a location to make a mark. Marks are made according to a mapping from the positive integers to another positive integer sequence.. The marks are arbitrary: they might overlap, they can be colored, semitransparent, and have any shape, but are always placed at the center of a tile in the underlying but not necessarily visible tessellation. In this case the mapping is from each of the positive integers i to another sequence such as floor[i * (n + t * ε)] where n is an integer, 0 < ε < 1, and t is an integer parameter, which can be thought of as a frame number in an animation. If t or ε were zero, this would simply map the integers to the multiples of n but when they are not I call the resulting pattern an in-betweener.